The Shumlin administration is parting ways with CGI, the vendor that built Vermont's still-incomplete health insurance exchange, Vermont Health Connect. The decision to end the contract is "mutual," according to Mark Larson, commissioner of the Department of Vermont Health Access. He announced the news at a press conference this morning, alongside Lawrence Miller, whom Gov. Peter Shumlin recently appointed as chief of health care reform. CGI has already received $57 million of Vermont's $83 million contract and, under the agreement, the Canadian company will leave the Green Mountain State with another $9.7 million, according to Miller. He noted that 97 percent of the exchange cost is federally funded. Since the federal government ditched CGI in January, many Vermonters have been clamoring for state officials to do the same. Miller acknowledged that people will view the step as long overdue. "There's no doubt in my mind that the biggest question is going to be, 'Why the hell didn't you do this months ago?'" he said. Miller's response? "Because it takes months!" Officials have been looking for a way to terminate the fraught arrangement for awhile, according to Miller, but they decided that now was the least disruptive time to do so for technical reasons. Taking over the troubled website is Optum, the vendor the state hired in June to help it resolve a pressing problem: Roughly 15,000 Vermonters need to make changes to their insurance plans but haven't been able to. That's because the exchange website still can't process what's referred to as a "change of circumstance." A handful of other states has also hired Optum to clean up glitches in their exchanges. Miller cited the difficulty of securing new contracts as one of the reasons the state didn't launch a competitive bid process for CGI's successor. "The state RFP [request for proposal] process ... takes forever," Miller said. "Something needs to be done sooner." He predicts pushback on that decision as well. "We are undoubtedly going to get hammered. I don't care." 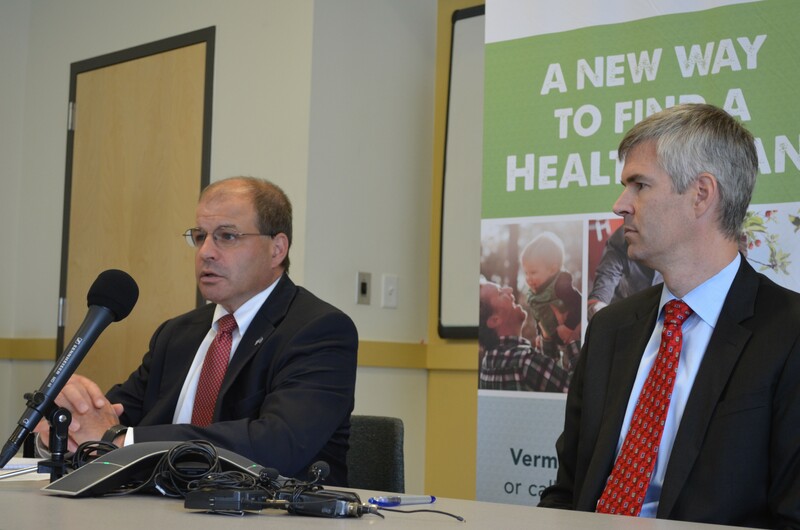 Vermont Health Connect has been plagued by significant problems since its launch last fall, and the Shumlin administration has long been critical of CGI's work. But at Monday's announcement, Miller declined to discuss whether the state erred in selecting the vendor in the first place. "I don’t think you normally ask when the relieving pitcher comes in whether the first guy ever should have been on the mound in the first place," he said. CGI officially cedes its work on the website to Optum on September 20, although Miller said the two vendors will have to work closely to make the transition work. "There's a lot of experience built up with this. Individual people know things," he said. "There is no magical transferrance of knowledge." Given the overlap, it "seems likely" the overall cost of the exchange will increase, Miller acknowledged, but the state has yet to figure out the price tag on Optum's contract. Linda Odorisio, a spokesperson for CGI, provided the following statement: "CGI is proud of the role it played in helping 85 percent of eligible Vermonters enroll in a health plan via Vermont Health Connect. With a majority of our exchange development work complete, we look forward to providing ongoing hosting services in Vermont for one of the country’s most successful health insurance exchanges."